While Elon Musk and Stephen Hawking sound the alarm on artificial intelligence, Neil deGrasse Tyson says he remains fearless about AI’s capabilities, and doesn’t believe AI will develop its own consciousness when we as humans don’t understand our own. Larry King: Elon Musk and Stephen Hawking have sounded the alarm on artificial intelligence. Mr. Musk called super intelligence humanity’s greatest threat. Do you agree? Neil deGrasse Tyson: Yeah, I am fearless of AI. And I’m an outlier, and I recognize this. And you might even say, “Well, if I studied the problem more deeply, I would be as afraid as others.” Perhaps. But in my life, I have probably written 10,000 lines of computer code. Uh, I have some street cred in just conducting the science that I’ve done in my life. What I can tell you is, when we imagine these AIs with thinking of some humanoid thing; as though the human form is something to emulate? No, no! If you have AI, you are gonna task AI in very specific ways. If you go back to the era of the Jetsons, here’s what they would’ve imagined: “Oh, instead of having you drive the car, have your robot drive the car.” They’re not thinking have the car drive the car! So the car then is an expression of AI, at some level. And so, we parcel the AI. The Hubble Telescope is an expression of AI, we program it and it does it. They’re worried about the general intelligence AI, where it can deduce and make decisions to you never programmed it to make. And I think that’s a kind of cool thing, if it can do that. I don’t have a problem with it. If it gets out of line, if it judges humans or a virus in this world in need of extermination? In America, you can just shoot it. I can unplug it. I mean, just bring it on. I’m ready for it. On top of that, they’re assuming, in some parts of it, that AI will achieve consciousness and thereby be self driven. We don’t even understand our own consciousness. You’re going to tell me we’re going to create a machine that on its own achieves consciousness? When we don’t even understand it ourselves? Um, no! Larry King: Stop making so much sense! 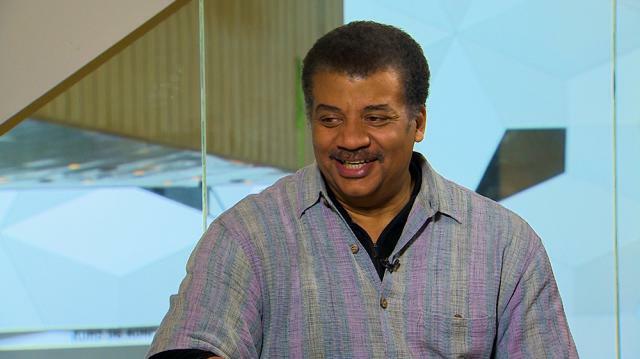 Neil deGrasse Tyson: I’m chill. I’m totally chill with it. Is that even still a hip thing to say?